It was a bright Easter Sunday, and I was sitting across from author Kevin J. Anderson at Elliott Bay Brewing Company in Burien, Washington. We were eating burgers, drinking beer, and talking about the world. 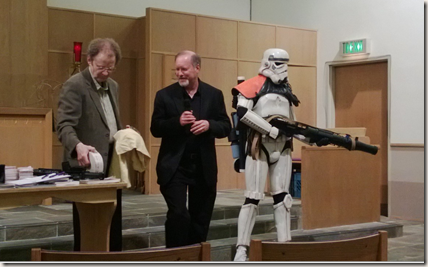 After the signing, Kevin had stayed over the weekend as a speaker for Norwescon, the largest Northwest Sci-Fi convention. Since I knew he was in Seattle for a few days, I'd invited him to lunch. As a writer and introvert, I knew what Kevin was talking about. I had to push myself out of my cave on a daily basis. Our lunch was a great example. Though we were meeting in person for the first time, I'd known Kevin's writing for many years. He first came to my attention with a spooky short story he wrote with Neil Peart (the drummer for Rush) called "Drumbeats" (part of the short story collection Shock Rock II). That story, about a drummer touring Africa by bicycle who finds a very unique drum, had always stayed with me. The writing was cinematic, and like a lot of great stories it got better with each reading. Full Disclosure: Kevin J. Anderson has been a friend of mine for about 20 years, and I have recently written an introduction for a forthcoming book of his stories [Landscapes]. A few years back we even collaborated on a short story called "Drumbeats" -- though Kevin did all the work; I just supplied some African background and French dialogue. Kevin Anderson sent me his first published novel, Resurrection Inc., in the late '80s, and I was extremely impressed -- it was so original, so imaginative, so profound, and at the same time so true to life. Around the time I read "Drumbeats," I'd actually been trying my hand at creative writing (screenplays, short stories, novels). But after years of rejection letters, I found another path as a technical writer at Microsoft in 1996, where I've been ever since. Being around all those technical people at Microsoft helped sharpen my technical skills. But it was other writers there, namely my friends Cheryl Lowry and Charlie Montgomery, who helped demystify the web publishing process. And so my Neil Peart fansite launched in 2004. What had started out as was a virtual thank you card to Neil Peart and Rush had actually been a beacon to other Rush webmasters, fans, musicians, and (of course) drummers. And like my lunch with Kevin, I would sometimes meet some of these people in person. In many ways, this website helped get me out of my cave and into the real world. 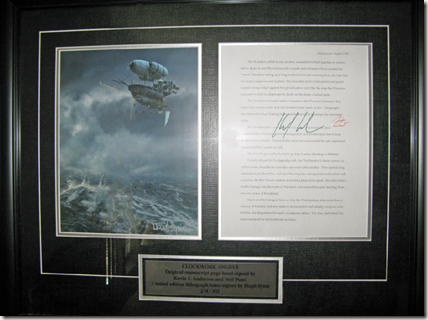 Early in 2012, Kevin announced that he was working on a novelization of Rush's forthcoming album, Clockwork Angels. For Rush fans, this novel would turn out to be an unexpected gift -- a bonus companion volume to one of Rush's best albums in their long career. The clanging bell and hiss of steam grew louder as he raced to the tracks. Upon landing on the glowing rails, the train transformed into a narrow stampede of mammoths, a long line of heavy cargo boxes and passenger gondolas lit with phosphorescent running lights, balanced by graceful balloon sacks. A geyser of exhaust bubbled out of the lead engine like the breath of a sleeping white dragon. Steel wheels rolled along the metal lines, and the engines huffed. During our lunch (and at his booksigning), it was clear that Kevin was a big Rush fan. Like many of us, Rush inspires Kevin. As he wrote in the press release for Clockwork Angels: The Novel, "You can find Rush references sprinkled through many of my Dune novels, the Saga of Seven Suns, my Terra Incognita trilogy. Probably more than even I can identify, because the music is so intertwined in my imagination." Which is what made this a dream project for him. As he told me over lunch, he and Neil had wanted to collaborate on a larger project for years, but the right idea and timing hadn't come together. Then during a lunch that Kevin and his wife Rebecca had with Neil in Santa Monica, Neil was talking excitedly about a new album he was working, Clockwork Angels. He said excitedly, "Someday there'll be a Broadway Musical, and a Novel -- even Ice Follies!" Rebecca said, "Novel? Who's going to write the novel?" Neil answered: "Well, Kevin is of course!" During the writing process, there was a feedback loop between Kevin, Neil, and artist Hugh Syme, as they traded work back and forth. The result, if you haven't seen it, is a beautiful, full-color book that spent two weeks on the New York Times Best Sellers list. 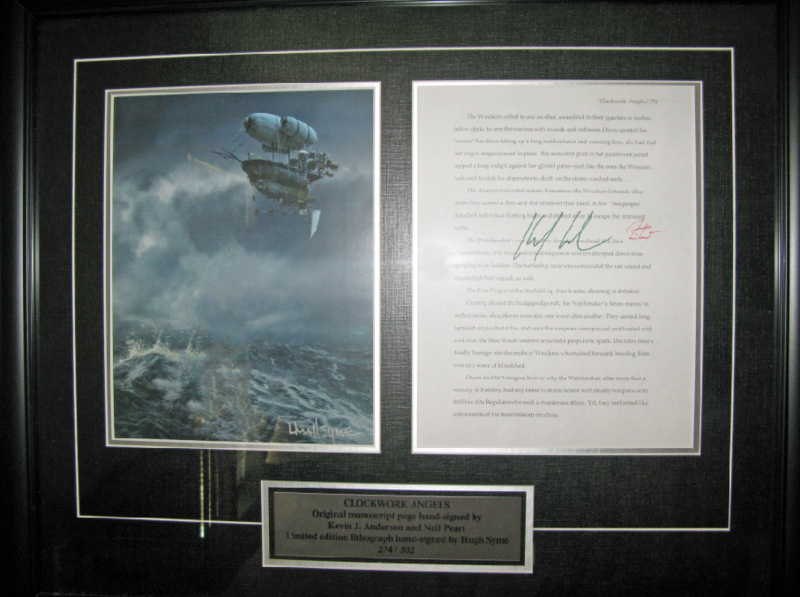 Since I'm a big Rush fan, I ended up buying the Gold Edition (#274), which included a framed original manuscript page and Hugh Syme lithograph (all signed). Kevin told me when they put these on sale, the demand for the Gold and Silver editions was so high it brought down the Rush server! On the drive back from Burien to Kevin's hotel in Sea-Tac, I got us lost for the second time that day (yes, a second time). As we got back on course (thanks to Kevin's iPhone), Kevin looked out the window at the massive apparition rising to the south and asked if it was Mt. Rainier. I said it was. I knew Kevin was an avid climber (having scaled all 54 of the 14,000 foot "Fourteeners" in Colorado). I asked if he'd ever climbed Rainier. He said he wanted to, but never had. He talked about how it's much easier to climb to 14,000 feet when you start from 5,000 feet (instead of from sea level, like Rainier). I pulled up to the Doubletree hotel, and we shook hands. Then Kevin was off to work on his latest book, and I was off to my Mom's 70th birthday party at another restaurant. As I drove on, I started beating myself up for getting lost. Kevin was totally easygoing about it, but it was embarrassing for me. In the end, I had to concede that driving around Burien was like driving in a foreign city (especially when your phone navigation fails). As I approached the exit for I-5 North, I saw a message on one of the traffic signs: "5-MILE BACKUP. EXPECT DELAYS!" 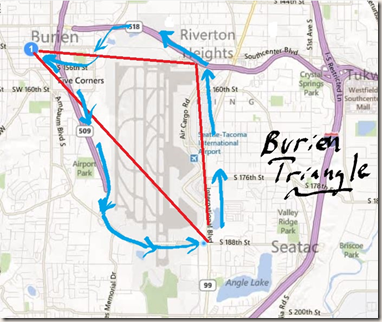 I decided to drive home the long way, on I-405 around Lake Washington, and then across the 520 floating bridge. It would take longer, but at least I knew where I was going. Read more about Kevin J. Anderson at his website, Wordfire.com. Read about how Resurrection, Inc., was inspired by Rush's "Grace Under Pressure. Listen to Kevin J. Anderson talk about Clockwork Angels.